A great old country home, tastefully appointed by preservation minded owners. The cabinetry is a mix of traditional paint finishes and classic mahogany that harkens back to New Hampshire's heritage of fine furniture craftsmen, while at the same time it accommodates today's efficient modern amenities. 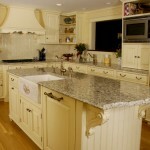 Rich details abound in this Quality Custom Cabinetry kitchen. This kitchen features clean lines and simple details that showcase the gorgeous Red Birch cabinet wood, topped by granite countertops honed to a soft matte finish. 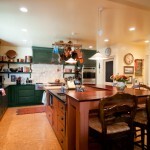 This cabinetry was made in our own shop, Vintage Custom Cabinetry. 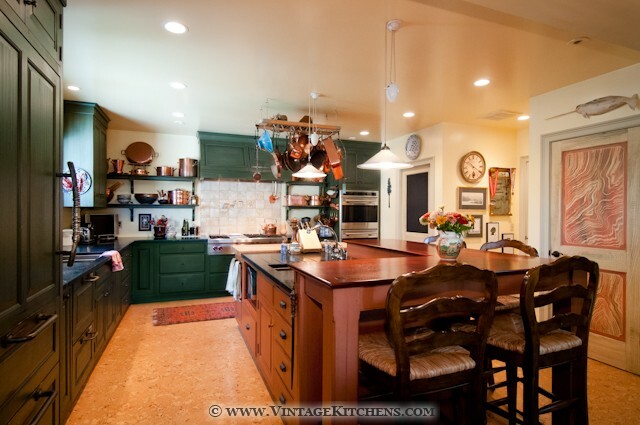 This Signature painted kitchen is in a wonderful old house painstakingly moved and rebuilt in this "West Edge" location in the early 1900's. 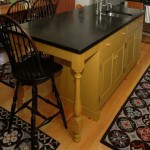 The island has a raised seating counter with a heart pine wood top. This kitchen features state-of-the-art Wolf and Subzero flush built-in appliances and Signature painted cabinetry. 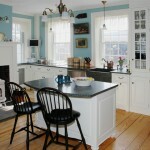 This Early American country style kitchen features three different colors of painted cabinetry. A gorgeous selection of wide red birch went into this Vintage Custom Cabinetry kitchen. 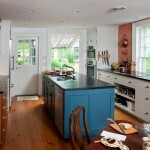 The painted Signature island cabinetry houses a traditional soapstone sink next to a modern stainless steel dishwasher. 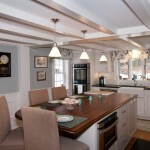 Original hand hewn beams are visible overhead and salvaged attic floor boards were refitted and refinished for the floor. The arch over the cherry island is reflected in the family room mantel. A generous island, with room to work and a place to sit. All the knobs and drawer pulls are cherry. 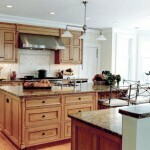 The island features a broad walnut countertop with neatly shaped edges. 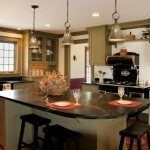 The island includes a seating area at the end with an attractive pedestal for support. 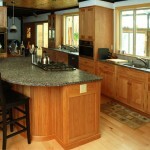 The island was made in our own shop using tiger maple from New Hampshire. The island is an asymetrical curved shape, with a sleek modern leg support and contemporary stools. Our installer Brett carefully assembles the custom curved pieces for the raised seating area at the island.